Irene Broni (Irena Radwańska), who died two years ago on July 22, 2016, was one of the most versatile and talented former Voice of America (VOA) Polish Service radio broadcasters. She helped to transform the Voice of America from being a colluding voice for Stalin’s propaganda during World War II to a genuine and trusted voice for freedom during the Cold War. As a teenager, she fought and was wounded in the first days of the 1944 Warsaw Uprising against the Nazis, which the then Voice of America in the United States Office of War Information (OWI), dominated by pro-Soviet sympathizers, almost completely ignored to comply with Stalin’s wishes who wanted to see the uprising fail and the Polish anti-communist underground army destroyed. Czesław Straszewicz, a Polish journalist based in London during the war, wrote in the 1950s about the harsh negative impact of VOA’s pro-Kremlin wartime broadcasts on the audience in Nazi-occupied Poland and among the free Poles abroad. After being sent to a forced labor camp in Nazi Germany following the collapse of the uprising, Irena later found her way to the Polish Army of General Władysław Anders which was fighting alongside American, British and other allied troops against the Germans in Italy. Since she was still a minor, the Polish Army sent her to a school in the British Palestine. After the war, like many Poles in the West who saw their country betrayed by U.S. President Franklin Delano Roosevelt and British Prime Minister Winston Churchill at wartime conferences with Stalin at Tehran and Yalta, Irena did not return to communist-ruled, Soviet-dominated Poland. She finished her education at a music conservatory in London and later worked as a pianist with Polish emigre artists. Later during the Cold War, she spent eight years as a host of various music and history programs at the American-funded Radio Free Europe (RFE) in Munich, West Germany. After emigrating to the United States and working several years as a pianist, Irene Broni, whose radio name at VOA was Irena Radwańska, joined in 1977 the Voice of America Polish Service team which was working to establish VOA’s reputation in Poland as a pro-freedom American radio broadcaster. This was achieved thanks to such great journalists as Zofia Korbońska, another hero of the Warsaw Uprising, Irena Radwańska and many others who had joined the VOA Polish Service after the war and replaced its former pro-Soviet staff. During World War II, the Voice of America was a major conduit for Soviet propaganda. Its first director, John Houseman, was forced to resign in 1943 after high-level officials in the State Department secretly accused him to the FDR White House of hiring Communists. But some of Houseman’s successors at VOA and some of the early Polish Service broadcasters continued to follow the Soviet line for the rest of the war by minimizing reporting on the Polish Government in Exile in London, its armed forces fighting the Germans, and the Warsaw Uprising. As hearings before a bipartisan committee of the House of Representatives revealed in 1952, some of these early VOA Polish Service broadcasters returned to Poland after the war to work as anti-American propagandists for the communist regime. The anti-Nazi Polish armed revolt in August 1944 was launched by the underground resistance movement Armia Krajowa (Home Army), which Irena joined despite her young age. During that time, VOA largely ignored anti-Nazi Poles like her because they refused to support Soviet rule in Poland. But in later years, thanks to Irena and her older VOA colleagues, some of whom also had fought the Nazis, survived the Warsaw Uprising and worked earlier at Radio Free Europe, the Voice of America Polish Service was slowly transforming itself into an uncensored voice of freedom from Washington. This change took decades to complete and required VOA Polish Service to protest from time to time against the upper management’s attempts to censor the truth about the Katyn massacre of thousands of Polish officers by the Soviet NKVD secret police and to resist occasional management directives to downplay human rights reporting. The Voice of America eventually became during President Ronald Reagan’s administration nearly as popular in communist-ruled Poland as the Polish Service of Radio Free Europe, which remained the most listened to and the most influential Western radio station broadcasting in Polish. 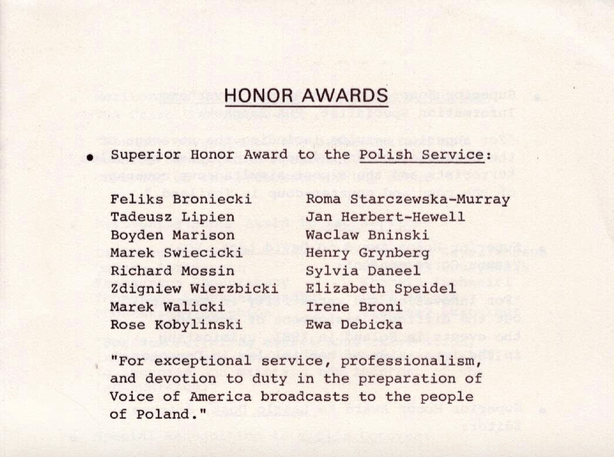 Irene Broni later received two VOA Excellence in Programming Awards for her popular Saturday radio show about life in the United States, Ameryka w Przekroju, and her special report from Doylestown, Pennsylvania, on the Polish-American observances of the Warsaw Uprising’s 45th anniversary. During that time, VOA broadcasters like Irene Broni who reported on all aspects of life in America adhered strictly to the VOA Charter. They produced programs that were informative, in her case also highly entertaining, and presenting a variety of different opinions on controversial issues. Partisanship in reporting on American politics was meticulously avoided by most foreign language service VOA broadcasters. With their rich life and professional experience, these Central European journalists also could not be fooled by Soviet propaganda. When faced with inaccuracies in some VOA English reports on Eastern Europe and the Soviet Union, they were not afraid to make their views known to VOA and United States Information Agency (USIA) officials. The majority of the upper agency management was strongly supportive of VOA’s Polish Service, especially during the Solidarity’s struggle for democracy. Many USIA and VOA managers during the time Irene Broni worked in the Polish Service had spent years abroad as diplomats or journalists, spoke foreign languages and were not permitted along with their immediate family members to do private business in countries ruled by oppressive regimes. Hiring personal acquittances was also not as easy as it has become in later years. Irene Broni was able to use her outstanding broadcasting talents. History was one of her passions. In 1985 she interviewed several current and former VOA Polish Service journalists who, like her, had led incredibly eventful lives in one of the most difficult periods of the 20th century. Former VOA Polish Service deputy director Zdzisław Dziekoński participated in the Warsaw Uprising for which he was recognized by President Reagan in a White House ceremony. Irene Broni also interviewed anti-Nazi resistance hero Zofia Korbońska who risked her life daily to send coded radio messages from Nazi-occupied Poland to a Polish radio station in Britain. Irene interviewed another Polish Service broadcaster Ryszard Mossin, one of hundreds of thousands of Polish prisoners in Stalin’s Siberian camps who was later a radio reporter with General Anders’ Polish Army in Iraq and Italy, worked for the BBC and Radio Free Europe and ended up with VOA. She also recorded a radio interview with her former husband Feliks Broniecki who was a Polish soldier in the West during World War II, worked at the BBC and Radio Free Europe, and later joined the Voice of America, where he retired as Polish Service director in 1982. Another one of Irene’s interviewees was a pre-World War II Polish journalist Tadeusz Strzetelski. My outstanding deputy Marek Walicki, a Warsaw Uprising survivor and former Radio Free Europe correspondent, recognized and encouraged Irene Broni’s radio hosting and interviewing talents. She was a dynamic radio personality who easily connected with her audience and listeners of various ages. She corresponded by letter with many of them in Poland and even invited one to stay at her home on a visit to the United States. She was a friendly and generous person. Marek Walicki’s photo (above) from KARTA website shows Irene Broni first on the left in a red and black dress. 1990, Waszyngton, USA. Nowy Rok w redakcji Sekcji Polskiej Głosu Ameryki. 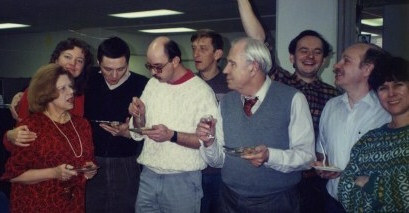 [1990, Washington, DC, Voice of America Polish Service New Year party.] Irena Radwańska, Helena Skotowska, Jerzy Rudzki, Marek Krzyżański-Parker, Tadeusz Walendowski, Marek Święcicki (trzeci z prawej) [third from the right], Wojciech Żórniak (z ręką w górze) [with his arm raised], Waldemar Chlebowski (drugi z prawej) [second from the right], Manuela Pinto Da Silva, originally from Portugal, who worked as a producer in the Polish Service. Fot. Marek Walicki, kolekcja Marka Walickiego, zbiory Ośrodka KARTA. Link. After her retirement from VOA in 1996, Irene Broni was active in various Polish-American organizations in the Washington, DC area, published a community newsletter, and helped to stage several plays by Polish writers in local theaters and a Polish opera at the Kennedy Center. In 2003, she helped to organize a campaign to send Christmas packages to soldiers from Poland serving in Iraq alongside American troops. Link to Lech Wałęsa video interview: Part One and Part Two. To this day some of the current and former Voice of America officials continue to ignore the most outstanding anti-communist VOA foreign language broadcasters while still praising pro-Soviet sympathizers such as John Houseman who had turned the early VOA into a propaganda mouthpiece for Stalin and tried to help Soviet Russia establish communist regimes in Eastern Europe. Irene Broni Radwańska was a proud Pole, a proud American and a great Radio Free Europe and Voice of America broadcaster in the noble fight against totalitarian ideologies and their propaganda. Some of the biographical information about Irene Broni (Irena Radwańska) came from the manuscript on the history of the Voice of America Polish Service written in Poland by Jarosław Jędrzejczak, a former longtime listener to VOA Polish broadcasts. 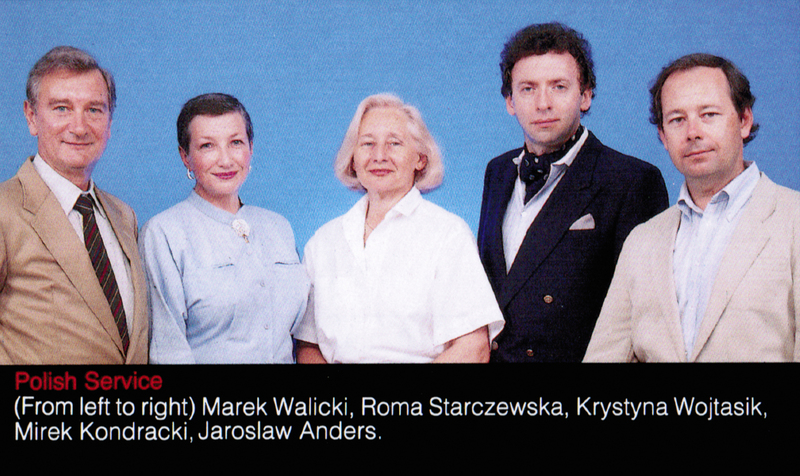 The photo of the VOA Polish Service staffers showing Marek Walicki, Roma Starczewska Murray, Krystyna Wojtasik, Mirek Kondracki and Jarosław Anders was originally published in the Voice of America promotional calendar for 1990. The image to the left shows a cover of the VOA Polish Service brochure from the early 1990s. Ted Lipien is a former director of VOA Polish Service and former VOA acting associate director. Ted, thank you for writing this article. It is nice to see that people think of my mother more than two years after her death. I hope that all is well with you and yours.